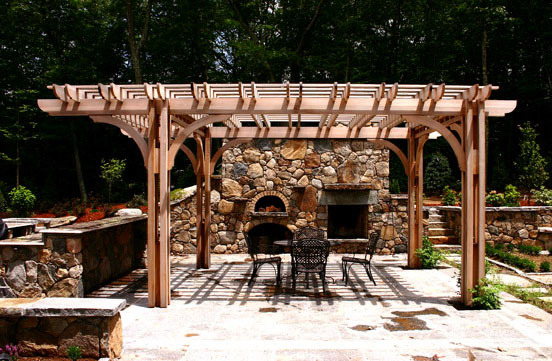 This large pergola is a perfect accent to a beautifully constructed outdoor kitchen. 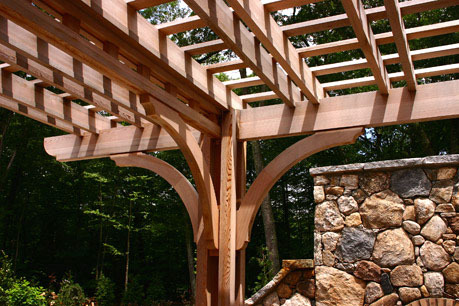 The pergola helps to define the outdoor room, while providing relief from the sun. Cantilevered over the outdoor kitchen area, the pergola has been scaled to complement the dramatic presence of the fireplace. Thick curved brackets are used to provide lateral support while creating a pleasing visual transition from posts to beam. Wide peaked purlins are supported by the paired rafters and provide significant shade. 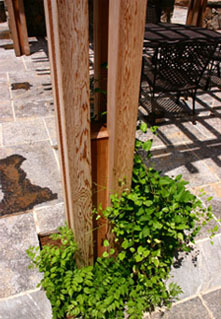 Large posts with copper caps were designed to provide an open and substantial trellis support. Two posts are placed in gardens to support vines that will soon cover the structure providing a visual accent and additional shade. 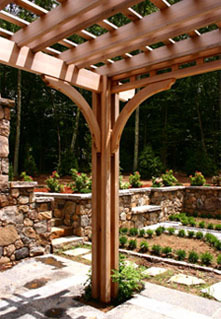 The cedar pergola is turning a soft gray and will blend beautifully with the masonry and the vines.